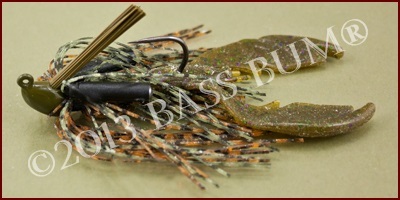 A swim jig is primarily a shallow water lure. However, like so many other bass fishing techniques it is slowly evolving to include deep water structure (as much as 40') as a productive place for its use. This is a bass jig lure intended to move quietly, though not absolutely silently, through the water. No excessive flash nor noise to attract or alarm bass is part of the presentation of a swim jig, though some will have rattles attached either by the manufacturer or the angler. Nevertheless, they usually project a large profile via the skirt and their relatively silent movement through the water can often provoke vicious reflex strikes. Since it appears more natural in its subtle movement it is less likely to alarm bass, as can a buzzbait, crankbait or spinnerbait. Even if not alarmed by them, bass can grow accustomed to noisy lures such as buzzbaits and the flash and vibration of spinnerbaits and avoid them. 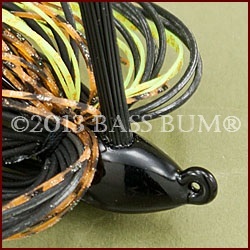 Bass will at times shy away from noisy lures and be drawn instead to a more subtle movement and sound level. That's where a jig that swims comes in. Jigs, as a family of lures, are known for catching big bass. The swimming jig is no less and may possibly be even more effective at drawing the big gals to strike. Swimming A Jig or "Presentation"
Are these type jigs easy to fish? Well, I would answer yes and no. The presentation is simple, but the retrieve not necessarily easy. A long cast is the order of the day when fishing swim jigs. So basically, you cast your jig as far out as possible past an area of submerged grass whose top is not deeper than 12", and this is a casting technique, not pitching or flipping. You then retrieve it over the grass just below the water's surface. If you're able, try and create a "bulge" on top of the water as you retrieve the jig shallow just under the water. It's important to "keep the lure up" above the grass. Steady retrieve, yo-yo or lift and drop? Which is better? The consensus is that a steady retrieve with perhaps a moderate amount of subtle yo-yo action is best for swimming a jig. There are different opinions on this of course. You were waiting for that weren't you? Here are a few different techniques. My suggestion? Try them all till you find the one that proves to be the most productive for you. Slow Steady Retrieve is the predominant technique. Slow, steady without any added action. This is not a search bait, which would be fished with speed. It's a lure that draws strikes based on visual signals seen by bass as it passes by some form of cover like weed, stumps or brush. Slow is the key word for you want it to float through the water appearing as an easy meal to bass. Yo-Yo Retrieve is one favored by no less than Kevin Van Dam. Simply done it involves the slight raising and lowering of the rod tip while reeling. Jig and Pop imparts a lot of action to the jig which runs a bit counter to the concept of presenting a lure that is subtle in its presence among bass. there is a school of thought that exaggerated movement with a swim jig actually reduces the number of strikes you get on a swim jig. Reel and Drop is used when the angler retrieves the lure closely past or over some cover and allows the jig to glance off the cover or drop down into an opening in grass. In these instances it's important to resume reeling as soon as the lure strikes the bottom. What Makes A Jig A Swim Jig? Fact is, any jig lure retrieved as a swimming jig can catch a bass, sooner or later. But, if you want to increase your odds of getting bit use a jig designed as a swim jig. The overwhelming size of swim jig fished is 1/4 ounce though they come as small as 1/8 ounce for very shallow water and can be found as large as 7/8 ounce for deeper water. The usual design is a jig with a bullet, triangular or wedge shaped head, like a grass jig. The line tie is sometimes "recessed" in the head (Title Shot and Paca), sometimes not (Critterbait, Strike King, BOOYAH). It is usually at a 30° to 60° angle. Additionally, it may have a "flat" bottom which serves as a plane to give a little lift to the lure. This will allegedly help push the lure towards the surface and contribute to the angler's effort of keeping the jig close to or just below the surface during retrieve. Some argue that flat bottoms cause the jigs to sink too slowly. Well perhaps. If your technique is to periodically kill the retrieve in open pockets of grass or around stumps so the jig can fall to the bottom. However, lead jigs tend to "drop" like a, well, a lead jig, despite its shape. A flat bottom on a jig head that comprises such a small surface area will likely have small effect on the drop speed, but some nevertheless. It will also contribute to a sway "back and forth" on the drop more so than a round surface. I think the benefit, even if slight, of a small flat surface helping keep the jig "up" just below the surface on retrieve and which adds "action" if it falls will draw the strikes you seek. Remember, there are few, if any, absolutes in bass fishing. There will always be more than one opinion about every aspect of the sport. If you scan through the many so called "swim jigs" on the market you will find jigs of all shapes and sizes represented. The bottom line? Experiment with several marketed as swim jigs and focus in on the style that works best in your hands. Better yet, make your own. Strikes on swim jigs most often result from the bass "seeing" the lure, since their nature is "subtle silence", especially compared to spinnerbaits and crankbaits. Though some will have rattles they tend to be the exception rather than the rule. As "visual" lures, color plays an important part in the effectiveness of swim jigs. Jigs can be made to resemble most anything a bass normally eats through the combination of skirt material (rubber or silicone) and color. Matching the hatch is fundamental with jigs period, but a broader range of critters can be imitated with swim jigs. A swimming jig can be made to resemble shad, shiners, creek minnows and even bluegill or crappie through the careful arrangement of skirt strands. A very few strands of "flashabou", some call it tinsel, added to a skirt can give it the subtle flash of baitfish. 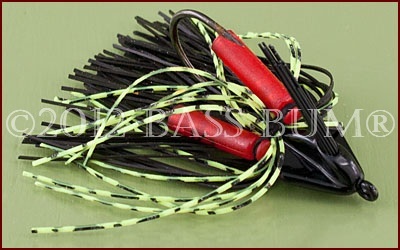 Some anglers will pooh pooh the idea of fishing swimming jigs that mimic the color combination of various bass prey. They'll opt instead to stay exclusively with white and swim it around weed lines as imitations of baitfish. That just seems to reduce the opportunities for catching bass to me. Balancing the skirt is important for making sure a swimming jig does not roll over during retrieve. Believe it or not it makes a difference to a bass. Go figure! These jigs tend to move through the water better with fewer than the 40 plus strands commonly found on regular bass jigs. The fewer strands tend to help the jig swim upright. A count of between 20-25 works well. A plastic trailer of some sort is really a must when fishing a swimming jig. 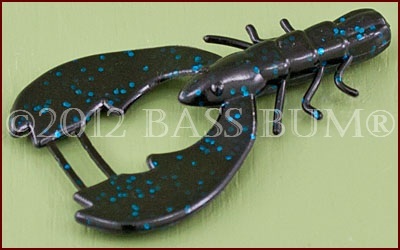 They can range in lengths from 3-6" in length depending on the size of the jig. 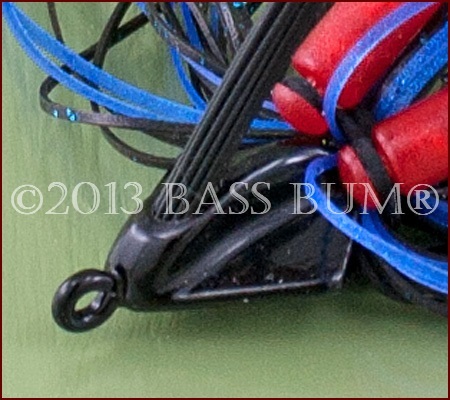 However, choice of trailers for swim jigs is a matter of experimentation and ultimately personal choice. It's natural to gravitate toward those with which you have experienced past success. In other words, the bass have told you they like these trailers in the past so you tend use them. But don't limit yourself. Experiment with different shapes, sizes and colors. Remember, this makes the fishing part of catching even more enjoyable. Take care not to use any trailer that is too large for the size jig you're fishing. This may overpower your jig and make it more difficult to maintain a retrieve high in the water column. I use double and single tail grubs from Zoom and Berkley as well as various NetBait Paca Craws and Baby Paca Chunks. Other trailers I've found successful with larger jig heads are the Berkley 3" Chigger Craw, Strike King's Rage Tail Chunk and the 3" Berkley Beast. I tend to match my trailer color to the dominant color found in the jig's skirt and jig head. Where Do You Fish A Swimming Jig? A swimming jig can be fished most of the year but avoid its use in cold, muddy water. Remember, it's a visual lure so water clarity is important. Stained is OK, muddy is not. Water above 50° is the starting point for its use and remains good for these jigs through the year till it again cools in late fall. These lures are at their best around grass, weeds and wood in shallow water. If you've fished spinnerbaits in these places try a swim jig instead. You'll likely be surprised at the result. A rig that will work well for a swimming lead jig is a 6'6" to 7' medium-heavy rod matched with a reel, either baitcasting or spinning, that is rated for 12-20lb line. Either monofilament or fluorocarbon line is appropriate. The latter is, of course, less visible, more sensitive and a good bit more abrasion resistant. Some anglers insist that 30-40lb braid is best. I'm not sure why you would need such heavy line when you're fishing "outside" the "stuff". Well, to each his own. That's what's great about bass fishing!